For single-family homes started in 2014, median prices, excluding improved lot values, range from $159 per square foot for contractor-built homes in the Pacific and New England divisions to $80 per square foot for speculatively-built homes in the East South Central division. The most expensive new single-family homes in 2014 were contractor-built homes in the Pacific and New England divisions with the median contract price of $159 per square foot. 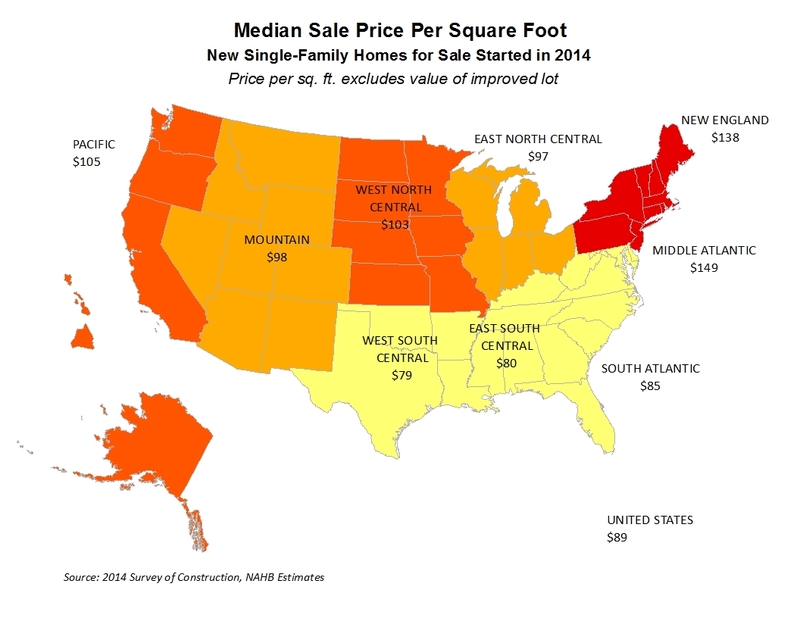 Just like a year ago, the Middle Atlantic division remains home to the most expensive spec houses with a median sale price of $149 per square foot, excluding improved lot values. The most economical homes are spec homes started in the South region, where median sale prices per square foot (excluding improved lot values) range from $79 in the West South Central division to $85 in the South Atlantic division, consistently below the national median sale price of $89 per square foot. 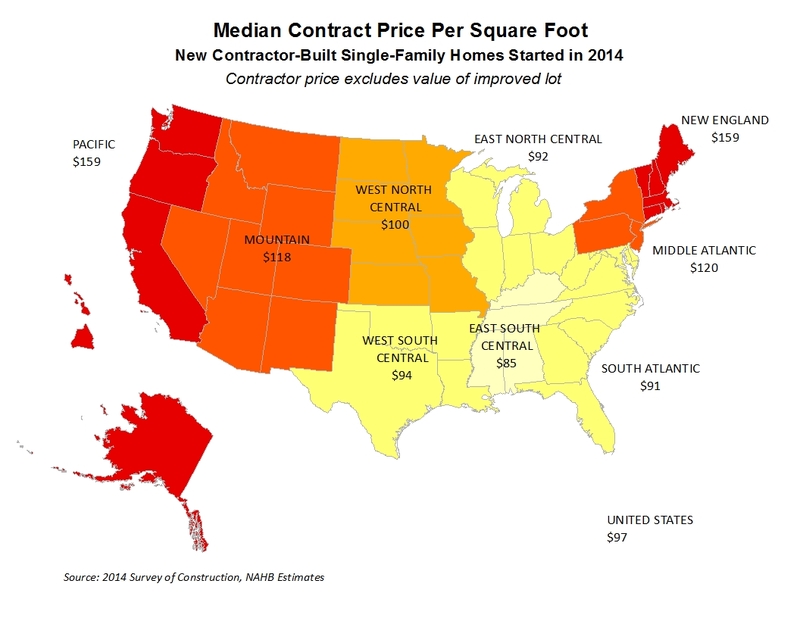 Looking at the contractor-built starts in the South, prices per square foot are slightly higher ranging from $85 in the East South Central division to $94 in the West South Central division but still below the national median contract price of $97 per square foot. The clear exception is the Middle Atlantic division where half of spec homes have costs per square foot in excess of $149 while the median for contractor-built homes is $120. In 2014, the East North Central and West North Central divisions also registered median sale prices per square foot exceeding median contract prices but the differences are not substantial. Nationally, square footage prices (excluding improved lot values) for both custom and spec homes increased just slightly, 4 and 2 percent respectively, compared to 2013. However, some regions registered much bigger increases. In the Middle Atlantic division, the median contract price per square foot jumped 17 percent and the median sale price increased 14 percent. In the West North Central division, sale prices per square foot increased 16 percent but contract prices per square foot registered a small decline. does anyoneknow if building materials for new home construction have risen 25% since july 2015 to January 2016?? Awesome article Natalia. Thanks for sharing! Here in Brazil the square footage prices, a few years ago, increased by more than 50%. It is impossible to buy a simple house here. Especially in big cities like Sao Paulo and Rio de Janeiro. Congratulations for the article, very interesting.